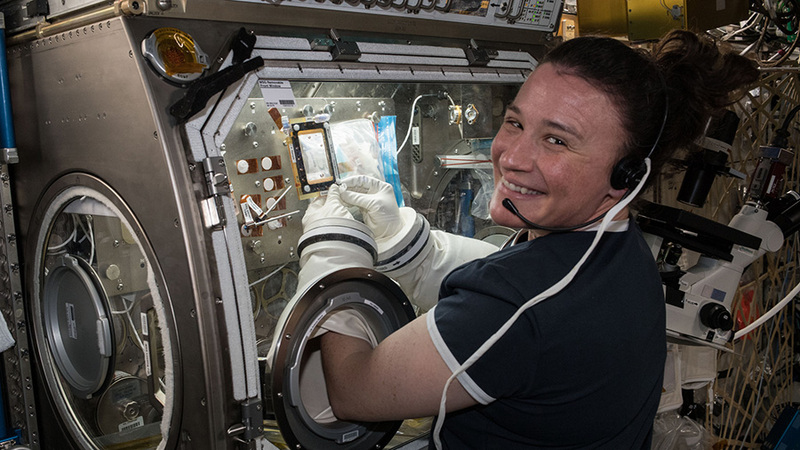 Flight Engineer Serena Auñón-Chancellor conducts research operations for the AngieX Cancer Therapy study inside the Microgravity Science Glovebox. The new cancer research seeks to test a safer, more effective treatment that targets tumor cells and blood vessels. The International Space Station got an orbital boost today to position itself for a crew swap taking place later this year. Inside the lab complex, the current residents spent their time today exploring a diversity of phenomena impacted by long-term exposure to microgravity. A docked Russian Progress 69 resupply ship fired its engines this morning slightly increasing the space station’s orbital altitude to enable the departure and arrival of a pair of Soyuz crew ships this autumn. Three Expedition 56 crew members will return to Earth Oct. 4 inside the Soyuz MS-08 spacecraft. They will be replaced a week later by two new Expedition 57 crew members when they dock inside the Soyuz MS-10 spacecraft. NASA astronauts Drew Feustel and Serena Auñón-Chancellor continued a second week of research operations to gain fundamental data about fertility in space. The duo examined biological samples in a microscope and stowed them in a science freezer for later analysis. The Micro-11 study is exploring the possibility of human reproduction in space including ways to address aging problems on Earth. Alexander Gerst, of the European Space Agency, explored the sedimentary properties of quartz and clay particles. The German astronaut mixed quartz and clay samples suspended in a liquid for photographic and video downlink to scientists on Earth. Observations can help guide future geological studies of unexplored planets and improve petroleum exploration here on Earth. Expedition 56 Flight Engineer Ricky Arnold of NASA split his time working on a variety of science gear that examines different microscopic properties. He set up Aerosol Samplers in the Harmony and Tranquility modules to collect airborne particles in the station’s air cabin for analysis. Arnold later stowed a Biomolecule Sequencer he used this month to sequence DNA extracted from microbes living on space station surfaces. I am interested in the AnxieX cancer therapy study. At one point it was stated they also used the drug Bevacibumap as an antiangiogenic therapy and that is interesting because we used it against Glioblastoma Multiforme in Neurosurgery,without much success unfortunately but it still looks like something interesting. I am very happy the guys up there are doing what they can to get new ways to get closer and closer to a solution to help our patients here on earth. Keep up the good work!